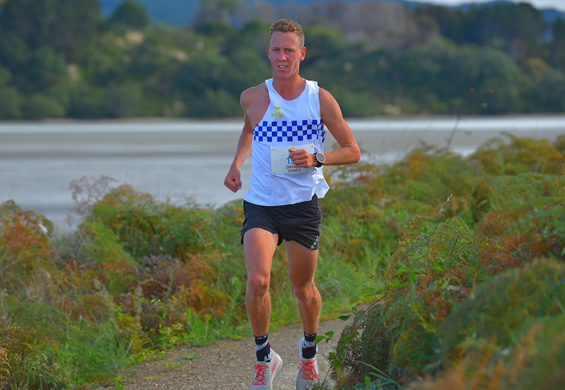 Jones, who three weeks ago blasted to a marathon PB of 2:18:40 in Japan, made a triumphant return home by completing the demanding 21.1km distance Whakatane Heads in Ohope in a time of 1:13:56. Behind, Tauranga’s Kyle Macdonald crossed the line second in 1:18:38 with ultrarunning specialist and Edgecumbe-based Sjors Corporaal claiming third overall and first masters athlete in 1:23:31. Sarah Gardner defied an ankle roll sustained in a training run the week before the event to secure a comprehensive win in the women’s half marathon in 1:29:16. 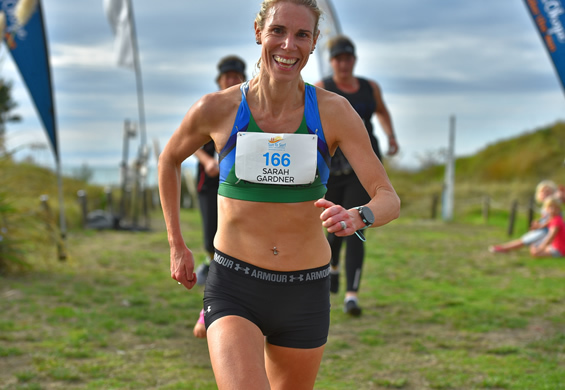 The mother-of-two from Papamoa who consequently struggled with the ankle in the off-terrain sections, was nonetheless delighted to add another 21.1km victory to her collection following wins in Taupo and Mt Maunganui last year. Completing the podium were Rotorua’s Siobhan Griffiths (1:37:31) and Whakatane multisport star Corrinne O’Donnell (1:40:00) – the cousin of men’s race winner, Daniel Jones. The men’s Surf Strider 10km event was secured by Whakatane local and New Zealand triathlon star Hayden Wilde in 33:17. Wilde, 21, who recently claimed a top ten finish in the Triathlon World Series event in Abu Dhabi, was more than satisfied with his outing and even happier to lend his support to the event. “There was a bit of a headwind to battle with but I’m really happy to finish in 33 minutes - I ran the pace I wanted to,” says Hayden, who now lives in Tauranga. The women’s 10km race was secured in a time of 41:45 by Rotorua’s Megan Grant. The inaugural Sun to Surf High Marathon attracted more than 550 entrants in the half-marathon, 10km and 5km event. A total of 10 per cent of entries for the events were given back to Whakatane Surf Club, Whakatane Swim School and Life Education. The best aid station prize of $1,000 as judged by Sun to Surf participants was won by the Top 10 Holiday Park, who elected to donate the money to their chosen charity.